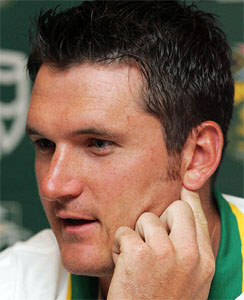 Melbourne, Dec 13: Graeme Smith, who became South Africa’s youngest captain in 2003, has said that he is still trying to prove himself and is a better leader now. “I think the best way to explain it is, when I took over the captaincy at 22 in 2003 there were so many doomsayers saying it was the wrong decision – He’s still trying to prove himself in the world of cricket, he’s just 22, how can he be captain?’” Smith (27) said. “There were so many critics and so, for me, it was all about proving everybody wrong. It was about going out and performing. It was about performance, taking the bull by the horns, showing that I could handle the job,” FOX Sports quoted him, as saying. “Showing that I could handle the pressure. Showing that I could score runs. Everything was about 100 per cent go. Maybe that came across as in your face, as trying to be too strong and trying to show everybody that I could handle it. “Within the squad and behind closed doors I was a lot more relaxed but, in the public eye, it was important to me to show that I was strong enough to handle everything. “But now that I’m a little older and a lot more relaxed and chilled out, I think I probably still carry a bit of that image from 22 or 23,” he added. He said that there may have been some misunderstanding, but he has certainly developed as a man and skipper in recent years and learnt to curb some of his controversial ways. That has come from experience of dealing with tough times on a personal and team level, such as the 5-0 pounding Australia gave the Proteas in six home-and-away Tests in 2005-06. Smith struggled with the bat during that campaign, regularly fumbling around his front pad, and with the intense spotlight he turned on himself for trash-talking the world champions through the press. Handed the captaincy after only eight Tests when Shaun Pollock was sacked following the 2003 World Cup debacle, Smith was not a popular leader at first.